Sunday was one of my typical days of prepping all that I brought home from shopping on Saturday, in less than 2 hours! I didn’t set out for anything in particular as I went shopping, but found many great buys that will make their way to our dinner plates throughout the week ahead. I couldn’t walk past 98 cent eggplant or asparagus at 98 cents per pound. Whenever I find eggplant on sale, I typically make Eggplant Parmesan, but having a tray already in the freezer, I thought about a grilled vegetable pizza and knew I’d be stopping off at the Italian import store for some peppery panceetta and pizza dough. As I continued my way around the store, the fennel flashed me back to a delicious Italian sausage and fennel sandwich I had a couple of weeks ago on crusty Italian bread. My mouth literally started watering, so in the cart went the fennel as I headed for the sausage aisle. Some of the best meals happen when you have no set plan in place! As I was in the midst of prepping, cooking, and storing, I came across the leftover mashed potatoes from a few nights ago – and they quickly became my go-to potato pancakes. That was Sunday – and we’ll be sinking our teeth into delicious meals all week long! What are you having for Easter dinner? I’ve made a ham for every Easter I can remember, and I just don’t feel like a ham this year. I started thinking about what to have, and although I’m still thinking, I might use that grilled eggplant in a vegetable lasagna (grilled eggplant, roasted red peppers, and spinach, topped with goat cheese, ricotta cheese, and mozzarella.) 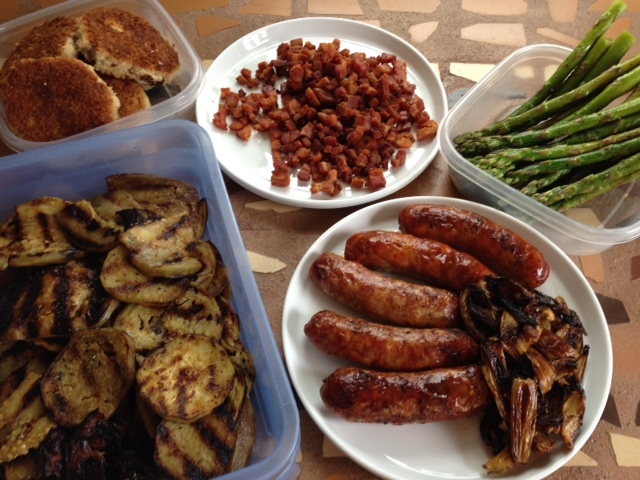 I’m thinking of grilling some chicken basil sausage on the side (for a little Easter je ne sais quoi,) make some garlic bread, a salad – and we’ve got Easter dinner. 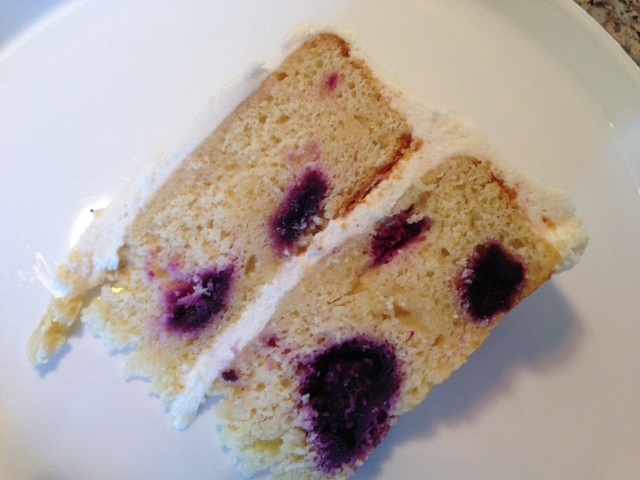 Whatever you’re having, you’ll want to make the most delicious Lemon Blueberry Layer Cake for dessert! I made this for our friend Christine’s birthday on Friday night – and it’s the perfect spring/Easter dessert. You won’t be disappointed. Mike came across this recipe a week or so ago (Sally’s Baking Addiction website,) and I’ll be making it again real soon. Here’s wishing you a week filled with good food and happiness! Buon appetito!